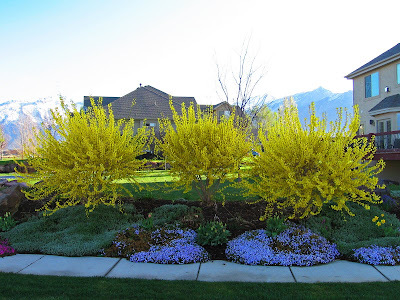 This Grandmother's Garden: Set your Forsythia Free! If you were to ask me what my favorite plant is, it would not be a Forsythia. I have never really liked Forsythia's. Until maybe now. This picture is from the garden of one of my sweet neighbors. What is it about these Forsythia that seem to be teasing me into finding place in my garden for a forsythia or two? These Forsythia are quite different from the bursts of yellow I see everywhere this time of year. These Forsythia are not pruned to death into unnatural globes with their flowers constrained to bloom in a single layer around their circumference. Nor have these Forsythia been neglected for many years and allowed to grow into a massive bush with sparse branches of yellow flowers on the outside of a deep mass of dead. These Forsythia are vibrant and vigorus! Thoughtfully planted in a space where they could fill the measure of their creation, their graceful branches reach heavenward unencumbered by crowding plants and structures around them. They delight in their very creation inspiring all who view them to do the same... what more could a gardener hope for? These Forsythia are blessed with a gardener who understands the secret desires of a Forsythia bush and is allowing them to be all that it can be... free and beautiful! I'm thinking I may need to plant a Forsythia or two. I love forsythia - but not the pruned variety. Fortunately gardeners in my neck of the woods understand that forsythia should be given freedom to grow but shouldn't be neglected. Around the corner from me there is a mass of forysthia that would take your breath away - it is as big as a city block but vibrant and healthy. When the blooms fade it is still beautiful all summer long.